Here is the current full range of Midi Hama Beads! These are by far the most common Hama Beads in circulation and can be found in a standard, pastel, fluorecent, glow in the dark, translucent and neon styles. 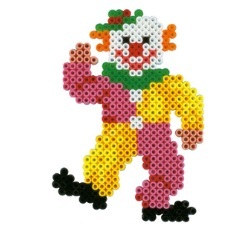 Standard Hama Bead Mix. Midi 5mm. 01 – White, 03 – Yellow, 04 – Orange, 05 – Red, 06 – Pink, 07 – Purple, 09 – Light Blue, 10 – Green, 11 – Light Green, 18 – Black. Buy! White Hama Beads. Midi 5mm. Cream Hama Beads. Midi 5mm. Yellow Hama Beads. Midi 5mm. Orange Hama Beads. Midi 5mm. Red Hama Beads. Midi 5mm. Pink Hama Beads. Midi 5mm. Purple Hama Beads. Midi 5mm. Blue Hama Beads. Midi 5mm. Light Blue Hama Beads. Midi 5mm. Green Hama Beads. Midi 5mm. Light Green Hama Beads. Midi 5mm. Brown (Dark) Hama Beads. Midi 5mm. Translucent Red Hama Beads. Midi 5mm. Translucent Yellow Hama Beads. Midi 5mm. Translucent Blue Hama Beads. Midi 5mm. Translucent Green Hama Beads. Midi 5mm. Grey Hama Beads. Midi 5mm. Black Hama Beads. Midi 5mm. Clear Hama Beads. Midi 5mm. Reddish Brown Hama Beads. Midi 5mm. Light Brown (Coffee Brown) Hama Beads. Midi 5mm. Dark Red Hama Beads. Midi 5mm. Tranlucent Black Hama Beads. Midi 5mm. Translucent Purple Hama Beads. Midi 5mm. Translucent Brown Hama Beads. Midi 5mm. Flesh Coloured Hama Beads. Midi 5mm. Beige Hama Beads. Midi 5mm. Dark Green (Olive) Hama Beads. Midi 5mm. Claret (Violet) Hama Beads. Midi 5mm. Burgundy Hama Beads. Midi 5mm. Turquoise (Pale Blue) Hama Beads. Midi 5mm. Neon Fuchsia (Neon Pink) Hama Beads. Midi 5mm. Fluorecent Perise (Cherry Red) Hama Beads. Midi 5mm. Neon Yellow Hama Beads. Midi 5mm. Neon Red Hama Beads. Midi 5mm. Neon Blue Hama Beads. Midi 5mm. Neon Green Hama Beads. Midi 5mm. Neon Orange Hama Beads. Midi 5mm. Fluorecent Yellow Hama Beads. Midi 5mm. Fluorecent Orange Hama Beads. Midi 5mm. Fluorecent Blue Hama Beads. Midi 5mm. Fluorecent Green Hama Beads. Midi 5mm. Pastel Yellow Hama Beads. Midi 5mm. Pastel Red Hama Beads. Midi 5mm. Pastel Purple (Mauve) Hama Beads. Midi 5mm. Pastel Blue Hama Beads. Midi 5mm. Pastel Green Hama Beads. Midi 5mm. Pastel Pink (Light Mauve) Hama Beads. Midi 5mm. Azure (Ice Blue) Hama Beads. Midi 5mm. Glow in the Dark Green Hama Beads. Midi 5mm. Glow in the Dark Red Hama Beads. Midi 5mm. Glow in the Dark Blue Hama Beads. Midi 5mm. Teddy Bear Hama Beads. Midi 5mm. Gold Hama Beads. Midi 5mm. Silver Hama Beads. Midi 5mm. Bronze Hama Beads. Midi 5mm. Pearl Hama Beads. Midi 5mm.